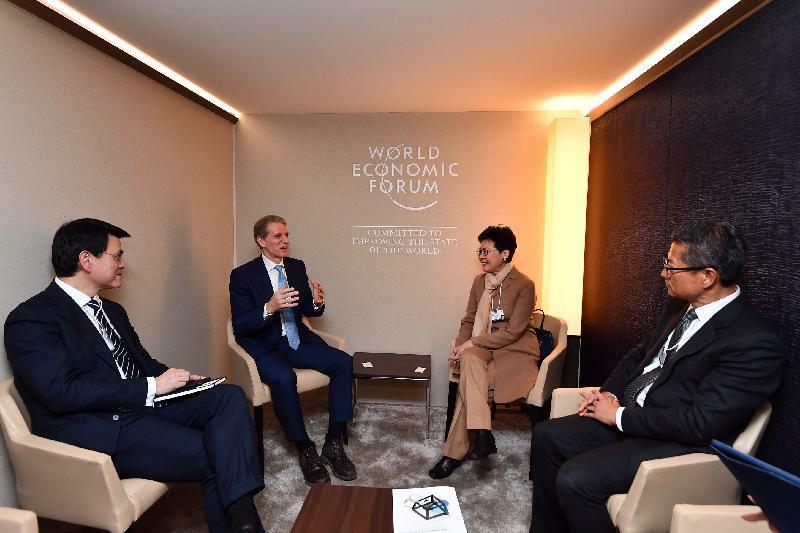 The Chief Executive, Mrs Carrie Lam, attended the World Economic Forum Annual Meeting (WEF) in Davos, Switzerland, today (January 23, Davos time). On the sidelines of the meeting, she has also met with the Prime Minister of Luxembourg, Mr Xavier Bettel, as well as leaders of different organisations and enterprises to explore collaboration in various aspects between Hong Kong and different places and organisations. 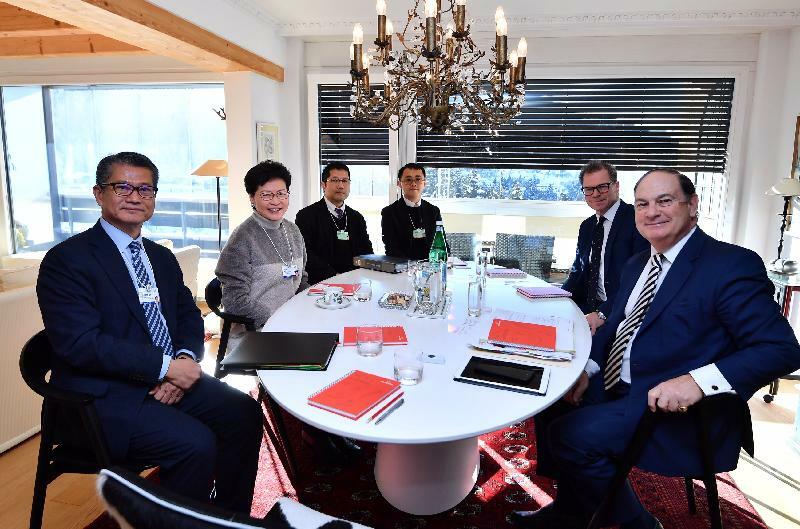 Mrs Lam, accompanied by the Financial Secretary, Mr Paul Chan, and the Secretary for Commerce and Economic Development, Mr Edward Yau, met with the Prime Minister of Luxembourg, Mr Xavier Bettel, yesterday afternoon (January 22, Davos time). 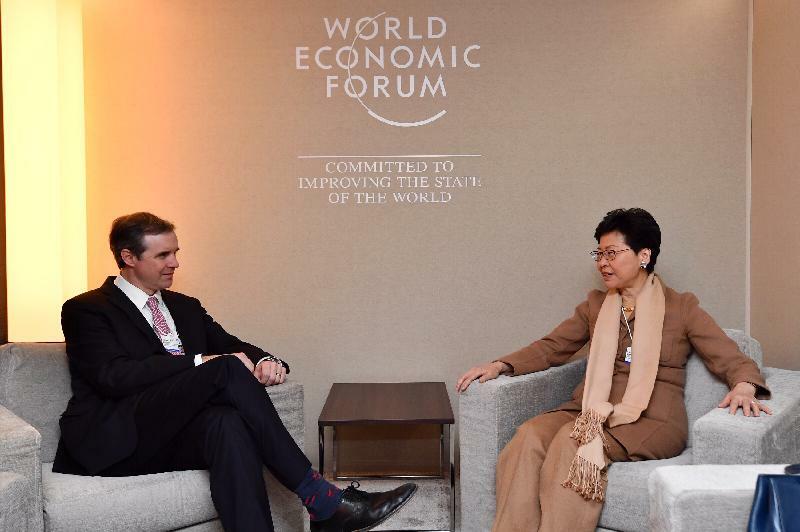 She said that both Hong Kong and Luxembourg are externally oriented economies and pointed out that Hong Kong is the gateway to the markets of the Mainland and Asia for enterprises around the world while Luxembourg is the gateway to the European Union. 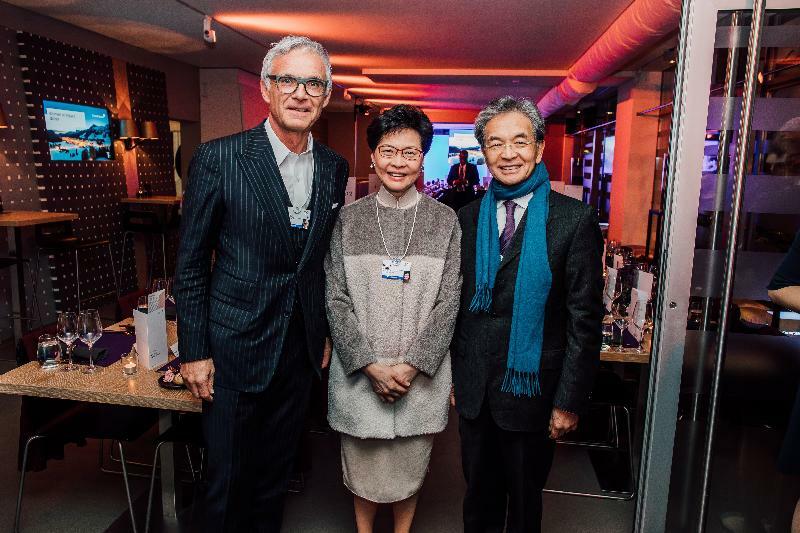 As Hong Kong and Luxembourg have been maintaining exchanges in investment, technology and talents all along, she expressed the hope that both places would enhance co-operation in other areas. She also invited Mr Bettel to attend the Asian Financial Forum in Hong Kong next year to share his insights with participants from around the world. This morning, Mrs Lam attended a WEF speaking session on the emerging markets outlook. Mrs Lam said at the session that Hong Kong, given its open and externally oriented economy, is inevitably affected by external factors, yet Hong Kong, a founding member of the World Trade Organisation, has been supporting and benefitted from free trade over the years. 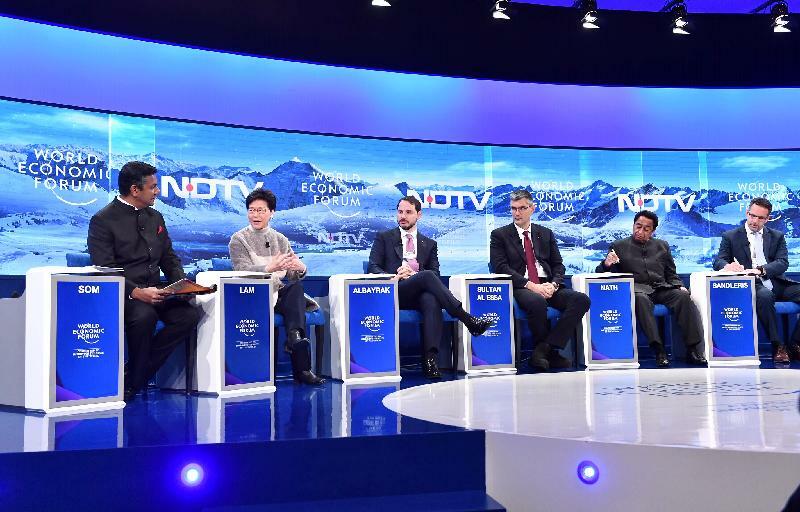 She said in particular that Hong Kong is proactively participating in the Belt and Road Initiative and willing to strengthen ties with emerging economies, including sharing with them Hong Kong's experience to help them develop. She also stressed the importance of sustainable and inclusive economic development to emerging economies. Mrs Lam, together with Mr Chan and Mr Yau, also attended a breakfast panel held by Standard Chartered to discuss topics including the global economic situation, China-US trade relations, innovation and technology, and women empowerment. Participating in the discussion included the Independent Non-Executive Director of Standard Chartered and former Foreign Minister and Minister of Finance of Nigeria, Dr Ngozi Okonjo-Iweala. Mrs Lam pointed out that Hong Kong's financial system is sound and resilient, and capable of tiding over any external economic shocks. She said with its strong competitive edge, the city will develop new industries and nurture talents. Coupled with the opportunities presented by the Belt and Road Initiative and the development of the Guangdong-Hong Kong-Macao Greater Bay Area, Hong Kong will develop steadily. Mrs Lam also met with the Chairman of Standard Chartered, Mr José Viñals before the breakfast panel to discuss the global and Hong Kong economic situation. Mrs Lam also met with leaders of different organisations and enterprises yesterday and today. On financial services, Mrs Lam, accompanied by Mr Chan and Mr Yau, met with the Executive Vice President and General Counsel of Marsh & McLennan Companies (MMC), Mr Peter Beshar, yesterday afternoon. MMC, a multinational professional services firm providing risk and insurance services and consulting, has been leveraging Hong Kong's role as an international financial centre and the gateway to Mainland China to develop its business. Mrs Lam encouraged MMC to continue to use Hong Kong as the platform to explore the Mainland and global markets. Mrs Lam also attended a reception held by the Credit Suisse Group yesterday evening to hear from the Group's Chairman, Mr Urs Rohner, on the company's latest developments in Hong Kong. This morning, Mrs Lam and Mr Chan met with the Chairman of Prudential, Mr Paul Manduca. Given that Hong Kong is actively enhancing the city's role as a regional insurance hub through tax policy and legislation, Mrs Lam said that Hong Kong will also help the insurance industry to seize the opportunities brought about by the Belt and Road Initiative and the development of the Guangdong-Hong Kong-Macao Greater Bay Area to explore more business. On innovation and technology, Mrs Lam and Mr Chan met with the President of École polytechnique fédérale de Lausanne (EPFL), Professor Martin Vetterli, yesterday afternoon. 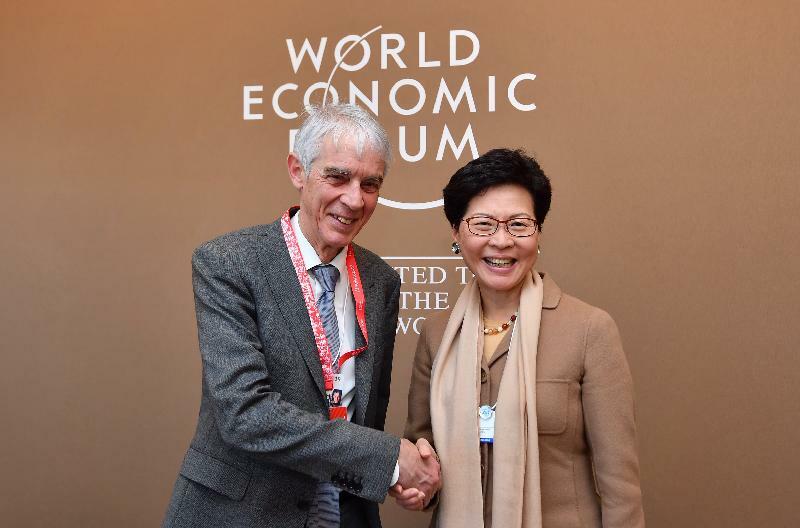 As EPFL is a globally renowned institution and particularly strong in the field of engineering and technology, she welcomed EPFL to explore collaboration with universities in Hong Kong and set up a presence in the research clusters being developed at the Hong Kong Science Park. Mrs Lam then met with the President of the Novartis Institutes of Biomedical Research, Dr James Bradner. She said that Hong Kong attaches great importance to the development of biomedical technology and encourages multinational pharmaceutical and biomedical companies to set up biomedical research centres and expand their operations in research and development in Hong Kong. Mrs Lam met with the Founder and Director of the Crossroads Foundation, Mrs Sally Begbie, yesterday afternoon. 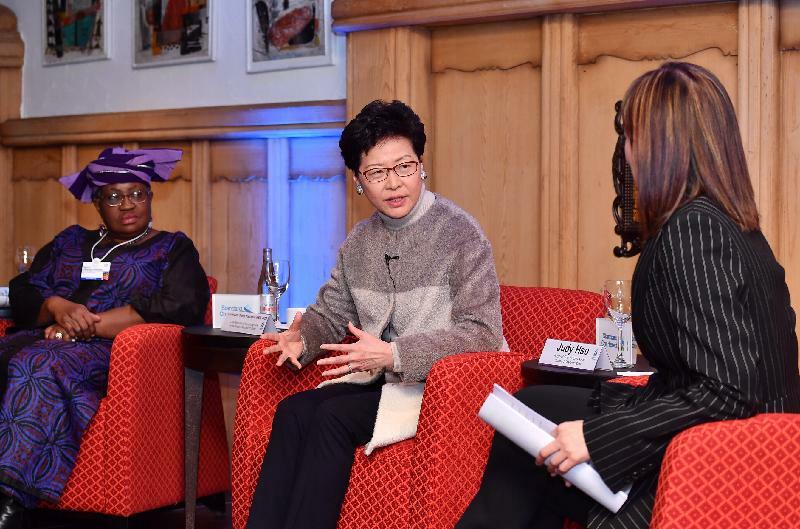 Mrs Lam expressed her appreciation to the Crossroads Foundation for its charity work around the world over the years, especially its participation in the annual event at Davos to raise the international community's concern about refugees. 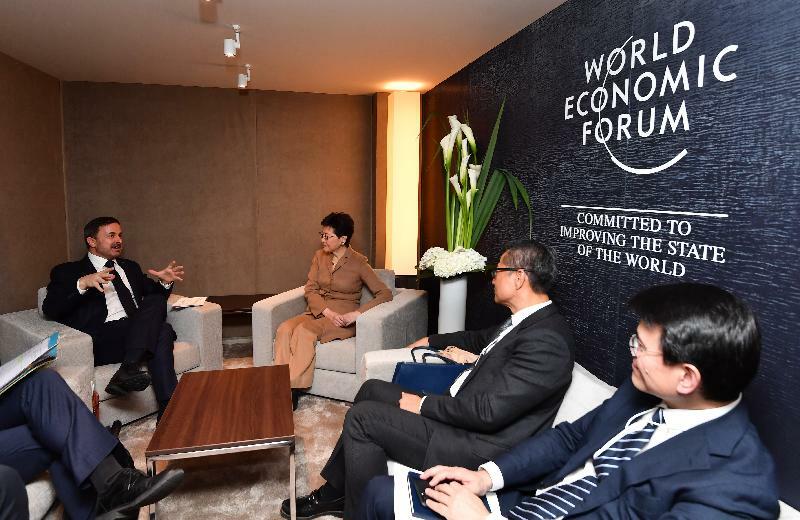 Mrs Lam also attended a dinner for heads of states and leaders of regional governments and organisations hosted by the Founder and Executive Chairman of the World Economic Forum, Professor Klaus Schwab. 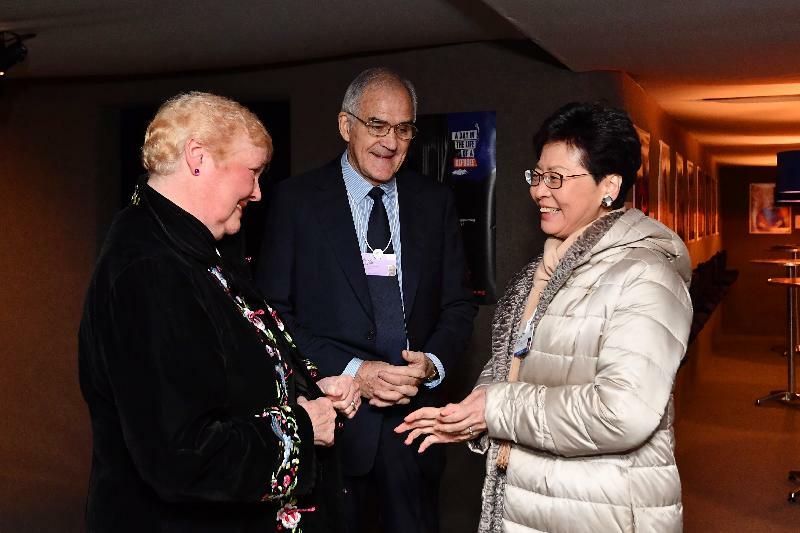 Mrs Lam is continuing her visit to Davos this afternoon.